Built in 1895, this symmetrical building exhibits many truly unique characteristics. While difficult to classify, it is probably best described as of the Queen Anne style popular at the time because of the blending of architectural elements from many other styles. There are many Italianate influences, as in the brackets under the eaves, while the overall symmetry and the front porch columns reflect Classical sources. Most unusual is the secondary, outwardly curving roof, suggestive of a Chinese pagoda. The frieze molding, elaborate cornice work and window treatments are generally typical of Queen Anne structures. The original school housed a library and four classrooms, divided by sliding walls, which could be pulled back to create space for community functions. This charming Victorian residence was built about 1898 for Louis D. Lawnin, Nelson's son-in-law. From about 1907 until his death in 1943 it was occupied by William H. West, office manager of the Nelson Brass plant and by his widow until her death in 1952. The house has been commercially sided and the wrap-around porch added. However, much of the Queen Anne character remains, as evident in the use of barge board (intricate shingles), leaded windows, and irregular roof line. This large residence was built around 1905 by Julia and Louis Lawnin for their growing family. The exterior is simple and workmanlike; however, the interior vestibule and bathrooms were elaborate, with extensive use of finished marble produced in the factory (since removed). Built in 1895, the N.O. Nelson residence is essentially a Federal style home, as seen in the window treatments and pediment over the front doorway. The original structure was characterized by a simplicity consistent with Nelson's values. The porch and 2-story classical columns were added by a subsequent owner. Built for the Allen family about 1890, this house is the purest example in Leclaire of the Gothic Revival style, though elements of the style are common. Typical is the symmetrical facade and the high-peaked gable roof line. Now sided, the original structure may have had board-and-batten wood siding common to the style and accentuating the verticality of the roof line. It is thought that the design was selected from a catalog of house plans-hence its nickname, "The Book House." One of the most unusual homes in Leclaire, this house is typically Queen Anne. Particularly notable is the wrap-around porch with its turret roof. The roof line is interestingly irregular, and the half-turret projections from the gable peaks and dormer windows repeat the turret-motif of the porch roof. One of the first homes around Leclaire Lake, this house was built about 1918 for Mr. and Mrs. Halquist. Mr. Halquist was the N.O. Nelson factory foreman at the time. The original porch railing has been removed. Otherwise the house has remained substantially unaltered. The style is one commonly seen in the Leclaire and Edwardsville area. Leclaire Lake was an important part of life in Leclaire as a site for recreational activity, including swimming, boating, picnicking and band concerts. A bandstand (not the present structure) stood on the west bank, and a sand beach was constructed for swimmers. This complex of buildings, designed by St. Louis architect A.E. Cameron, housed all the manufacturing functions of N.O. Nelson Company. Special consideration was given to worker comfort and safety. Large, arched windows and skylights provided lights and ventilation, and a sprinkler system was installed for fire safety. 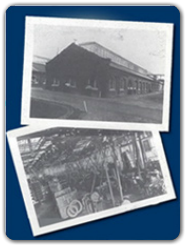 Each building housed a single manufacturing process and was equipped with electrical lighting. Built in 1889, this railroad station provided N.O. Nelson Company with access to several major railroad lines. It served the community of Edwardsville until 1967.